I meant to get to this wrap-up much sooner than now but time waits for no one. Especially the busy. When we were developing our business plan, pro forma, and just generally looking for advice. One place we turned to was SCORE. Aligning with your SCORE mentor is important. We were lucky when we were introduced to Chuck Sawicki in that he was able to understand who we were and even had some good ideas on where we could one day be. 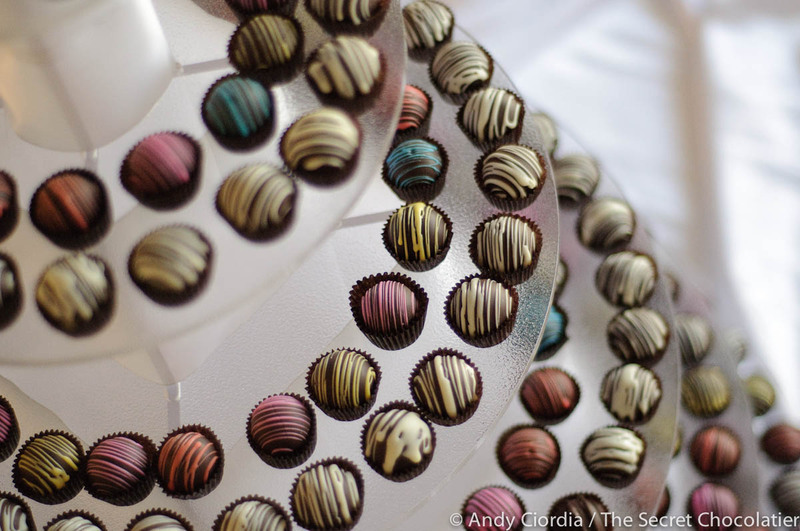 We were asked for the 2011 SCORE Awards to produced a boxed set of dark chocolate sea salt caramels for the 500 attendees. Least to say we were very honored to have been chosen to share our confections. We all brainstormed for some packaging concepts and settled on a nice octagonal box with hot-stamping of the SCORE Awards logo. Then I came up with a neat little idea to have a fortune-cookie-eske slip of paper that would have a number of notable quotables and on the backside have our information and a little QR Code for the savvy. Chef Bill produced and dipped caramels for 3 days to create the 1000 units required. His recipe for these gems was still in the firming up to memory stage so this allowed him a lot, and I mean a lot of repetition for the amount of small batches that had to be made. Then it was Logan and my turn to get to work. At this time he was such a light weight I could hold him for hours while I folded boxes. With it all complete we excitedly loaded up our 50+ lb of confections, iced down, and shipped to DC. It was funny because we were all a little giddy. It is always exciting sending out a big package of our chocolates or confections, you just know they’re going to be well received. A few days later phone calls and emails came in telling us how much the attendance loved our confections and that they had even put a few of our images like the ones here on a big screen showing the family at work. It did our hearts good, always does. We’re happy to have been a part of SCORE’s celebration and appreciate their helping us. We look forward to how we can continue to use such services like SCORE and the SBA in the future as like Logan, we grow up. If we can help your next function be even better, contact us and lets talk about it!